Hi, I have been trying to change my email address on my profile, but it won't register. I save the new password and then enter my password and press confirm. But when I go back and look at my email address, it isn't changed. @SharonS_579 - we may be experiencing issues with a couple of aspects of the forum. You could try creating a new account, or we could see if @SBryanW or @Gabe can help. 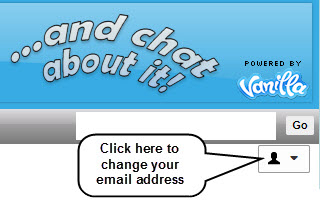 Or are you trying to use an email address you have already created another account with? @SharonS_579, so you went to your profile and then clicked the little black head icon on the far right, beneath the word GO, and then changed the email address stored by the forum. But after doing that you checked it and the change did not stick? I haven't changed my email address in a very long time, so I don't recall if I had to enter a password but it makes sense. Perhaps you need to wait a bit to let the forum update the change. Let me know if it continues to be stubborn and I'll see if I can contact Bryan, who can contact the company that hosts the forum. Yes, Gabe, that is what I am doing. It seems to accept the change, but when I sign out and sign back on and check my profile, the old email address is shown. I have changed accounts and no longer use the current email. If I create a new account, I will loose all my posting data and bookmarks, etc. @SharonS_579, well, I don't know what to say. I tried it myself; changed my email address, entered the password and let it marinate for a few minutes. Checked it and it was back to the old email address, not the new one. So, I can't offer any more suggestions. You did it correctly, but it just didn't take. Sorry. Maybe you can put in a trouble ticket to let the company know about this issue. Not sure if that would help, but it couldn't hurt. You are welcome. Sorry I didn't have better news. The forum is still here and that is something. At least we can still talk to each other.